Hold the bread, you won’t need any for this amazing low carb cauliflower stuffing recipe! This stove top stuffing takes no oven space whatsoever and is ready in less than an hour. 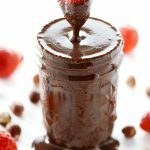 It’s also dairy free, gluten free, grain free and starch free! I’m all about saving oven space when it comes to making Thanksgiving dishes and this includes this cauliflower stuffing recipe. 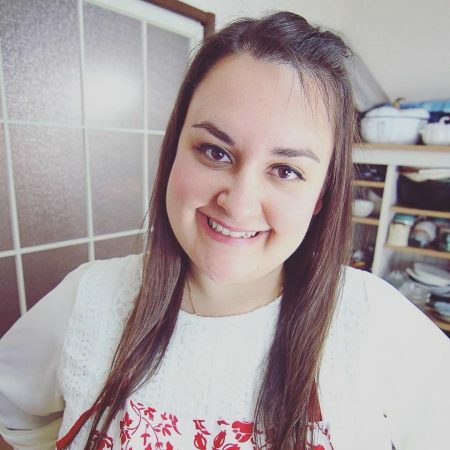 I already make so many dishes cooking in the oven ranging from my herb roasted turkey, low carb meat pie, or keto biscuits, that I usually don’t have any space left for anything else. Oh and if you’re going to be baking thanksgiving desserts as well like my pumpkin bundt cake recipe, you can forget about using oven space as you simply won’t have enough. This is where this low carb stove top stuffing comes in. 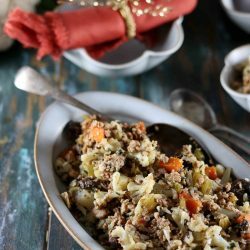 The entire low carb stuffing is made in one pot for your convenience and is ready in less than an hour! What Exactly is Cauliflower Stuffing? Cauliflower stuffing isn’t your ordinary stuffing recipe. No, it’s even better. 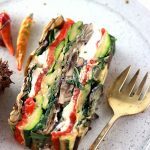 Forget trying to find a good low carb or keto bread recipe that doesn’t fall apart or become a soggy mess when you attempt to make your low carb stuffing recipe. Cauliflower stuffing is the next level keto stuffing. 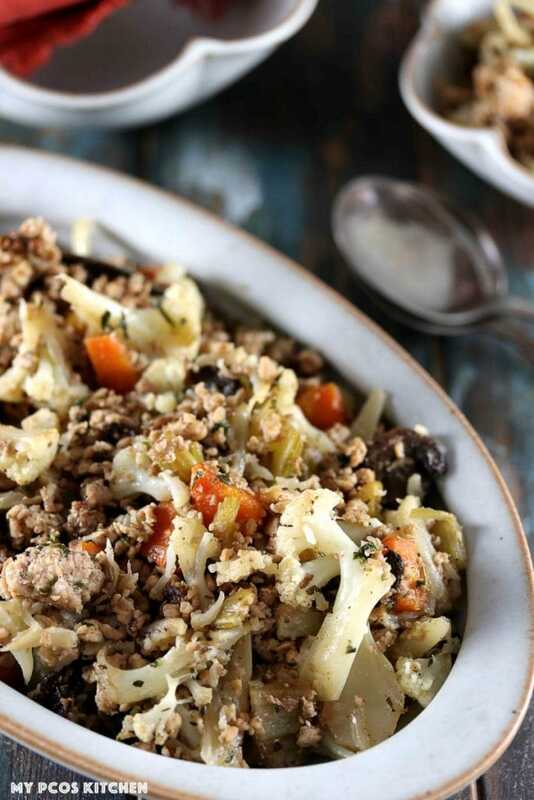 Instead of using bread, use healthy cauliflower florets to make your dish even lower in carbs and the best thing is that it’s ready in less than an hour! You could go full vegetarian for this dish if that’s your thing, but I chose to add some ground chicken because I’m a huge carnivore! 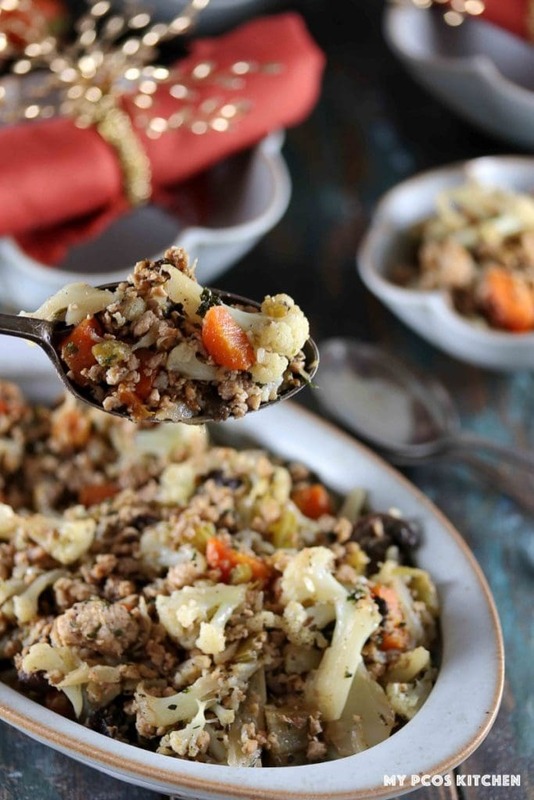 I usually add ground pork or sausage to my stuffing recipes, just like I did in my low carb stuffing recipe that I uploaded last year, but this year I decided to change things up a bit. 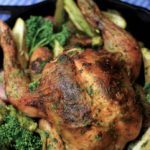 Chicken goes extremely well with thyme, sage and parsley. 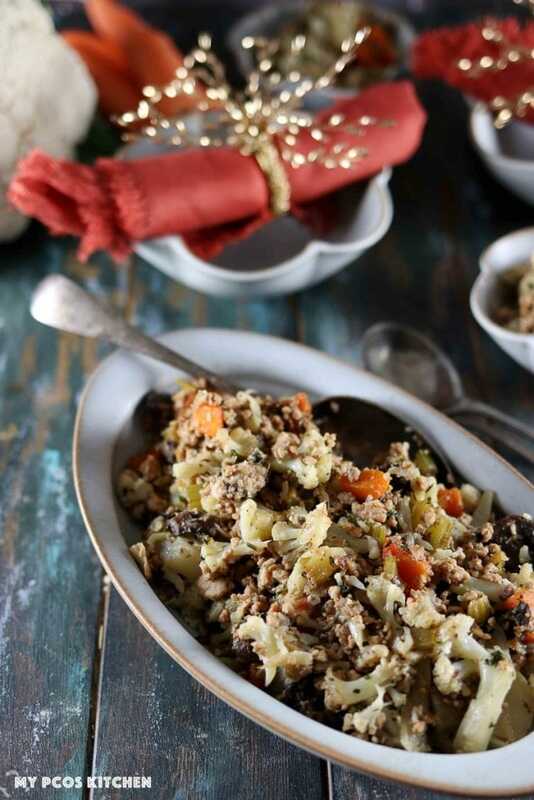 I found that it would compliment the cauliflower florets really well making it the best low carb sausage stuffing you’ll ever make. I also added a bit of chicken bone broth to the cauliflower stuffing casserole to make the cauliflower florets really absorb that chicken flavour. You can use any type of broth you have, though, whether it’s granulated or not. I had some leftover chicken bone broth in the freezer from a bird that I had baked so that’s what I used. What’s the difference between stuffing and dressing? Technically if it’s cooked inside the turkey, it’s called stuffing and if it’s cooked outside the turkey, it’s called dressing. However, my family and I have always called it stuffing and we’ve always cooked our stuffing outside the turkey. For me dressing sounds weird as it sounds like salad dressing. Even when you google “dressing recipe”, you’ll only get search results for salad dressing recipes. Whether you bake your stuffing in or out of the turkey, it all depends on your family, traditions and method. I, personally, will always call it stuffing no matter how I bake it. This cauliflower dressing or cauliflower stuffing is best cooked on the stove top and not inside a turkey. You can choose to stuff the cavity of your turkey with it, but it’ll end up really soggy as it’s just vegetables and a bit of meat. You’ll want to use the largest pot you have on hand as raw cauliflower takes a whole lot of space. I used a 7.25 quart dutch oven from Le Creuset and the raw cauliflower florets just fit in it. However, once they cook down, they will reduce to half their size and you’ll have more than enough space to make your cauliflower stuffing! In your large pot, you’ll add a generous amount of butter and let it melt. You’ll then add your onions, carrots, garlic and celery. I decided to cut the carrots into thick slices so that it could have more flavour. 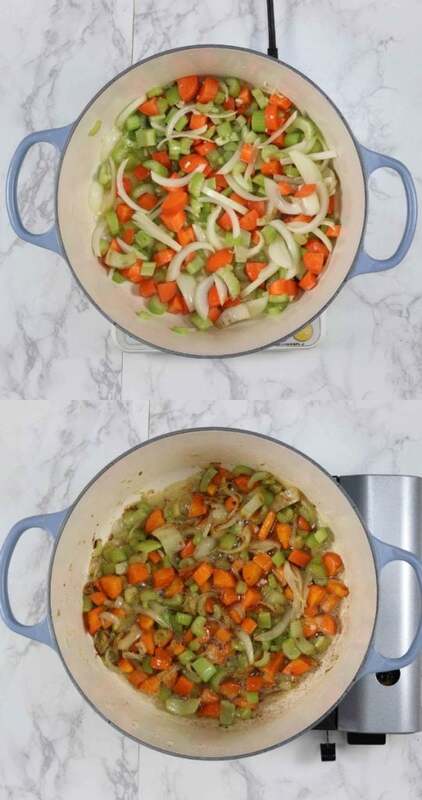 You’ll want to let the vegetables cook on low heat for a good 10-15 minutes, or until the onions start to caramelize and the rest of the vegetables start to soften. This step is important because you don’t want to have crunchy vegetables in your stuffing. Cooking them on low heat and caramelizing them will ensure that your paleo stuffing is soft and full of flavour. You really want to have that buttery goodness to cook through your cauliflower stuffing recipe. If you eat dairy-free, you could use ghee if you can tolerate it, or some butter flavoured coconut oil. Once your veggies have softened, you’ll then add the ground chicken and cook it through. You’ll want to break the meat apart as it cooks as you don’t want to have large chunks of meat in your keto stuffing. You can either use ground chicken or ground pork, it’s up to you. I decided to go for chicken as my bread stuffing usually uses pork. If you’re vegetarian, you can simply omit it. The next steps are to add the mushrooms and the fresh herbs. I used a combination of parsley, thyme and sage. Try to use fresh herbs and not dried ones if possible. If you don’t have access to any, it’s not the end of the world, but fresh herbs give much more flavour to this cauliflower stuffing that you and your guest will enjoy much more. I personally used some fresh parsley and thyme, but couldn’t find any fresh sage in my local supermarket. You’ll then add your raw cauliflower florets. It’s important to cut your cauliflower florets as small as you can, as larger pieces will be harder to eat and will take longer to cook through. Sautee them for about 3-4 minutes before adding the chicken bone broth to your pot. Add the chicken bone broth, cover with your lid and let steam for 3 minutes. Remove the lid and let the chicken bone broth liquid simmer down. You really want the cauliflower to absorb the bone broth and the spices so it’s best to let it simmer down until all of the liquid has been evaporated and absorbed. If not, your stuffing will be pretty wet. If you let it simmer down on low-medium heat, it should take 5-10 minutes for all of the liquid to evaporate. You really want to have no broth left like in the picture below. Once that happens, your cauliflower stuffing recipe is completed! Simply replace the bone broth for some vegetable broth. As for the chicken, you can just leave it out or replace with with some vegetarian meat if you prefer.